I havent posted for a couple of weeks, because a huge project here in the house has been drawing to a close. My wife, Kimberley, and I decided some months ago that a major home renovation was in order. We had an unfinished basement, and it was time to turn it into a finished basement. Besides the wine cellar and bathroom that would go in...I'd get a new game room...YES! We engaged a contractor and framing started a couple of months ago. Here was one corner of the basement that would turn into my new boardgame center. An early view of the new man cave. The boardgame nook gets custom shelves. Seen to the right is a custom shelving area where my Warmachine armies would eventually live. Reverse angle...lighting is in and working. Paint is up and under-padding for the carpet is in. And now the carpet appears. Sweet. The boardgame nook is ready to be filled. And now it is! Awesome. It felt great to unload all those cardboard boxes that had been sitting in the garage for the last few months. I had a couple of new game tables commissioned. The 6'x4' is on the floor in the background here, waiting for its legs. However, the 8'x4' table is up...I couldn't be happier. I had it built to bar-top height, so it feels really big. Looking back into the magazine corner. 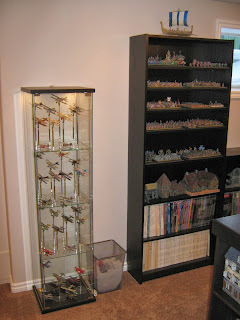 My Warmachine armies are now in their new shelves. A view of the main part of the room. And a close up of my WWI panes. 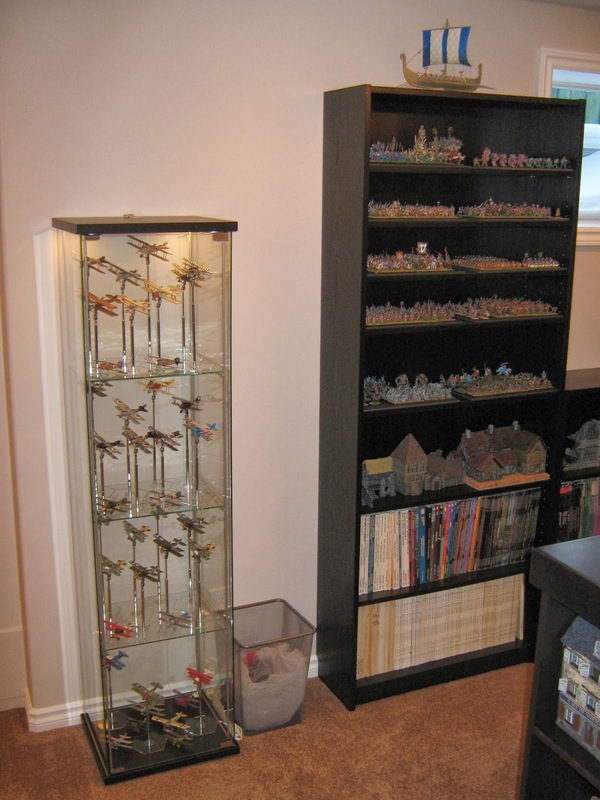 Shelves also house several historical, fantasy and sci-fi armies. And plenty of periodicals and game supplements...and game terrain. Well, there it is...the last great project of 2013. Setting up the room has taken some time, as you can imagine. Can't wait to have my first game down there. Happy Hew Year's Eve, everyone. Hope you had a great 2013. Last Thursday, I ran the third and final painting workshop up at Thunderground in St. Albert. This time around we concentrated on painting cloth and metal. We started off with a discussion on the behaviors of certain colors, and then moved on to some of the major differences between the major hobby acrylic paint manufacturers. For cloth, we covered the basics of layering and blending techniques. For the metals, we focused on wet-brushing, using appropriate-colored washes, and finally, dry-brushing. This series of workshops has been very fun to put on, and many thanks to the LGS owner, Roy Kim, for giving us space and providing support. 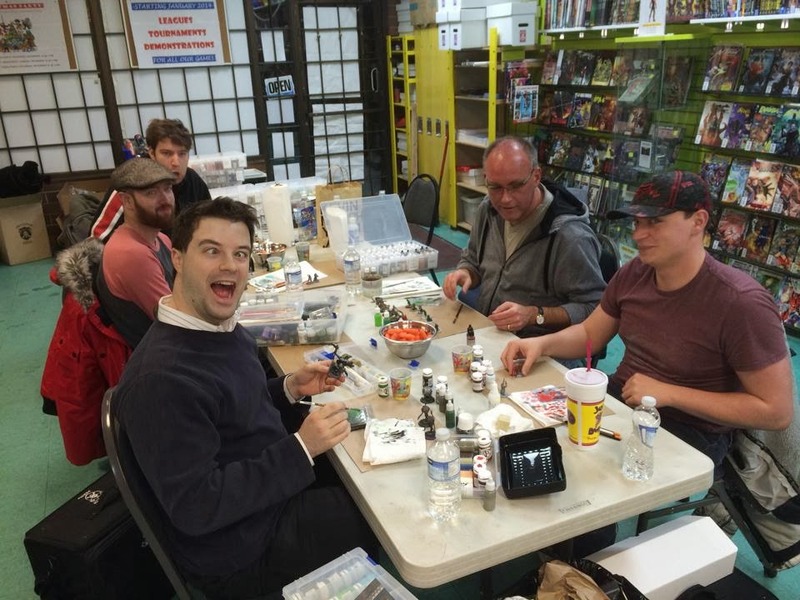 The holidays are just about here...which will mean some serious hobby table time. Don't know what the Christmas project will be yet...we'll see. Anyway, this weekend I finished off Lady Aiyana and Master Holt, a Mercenary Character Unit. I had started them many weeks ago, but they kind of stalled out at the skin stage. Holt is pretty much painted from his Privateer artwork, but with Aiyana I wanted to add in a few more colors to try some stuff out (and tie her closer to Holt with the blue base color). 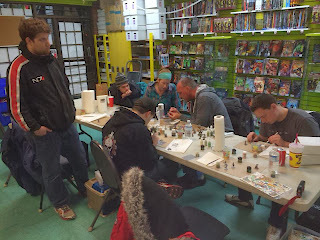 Last Thursday night I ran another painting workshop up at the LGS, Thunderground, in St. Albert. Roy had the tables set up for us, and this week we worked on skin. We hit caucasian, zombie and goblin skin during the couple of hours we were there. Well, this turns out to be post number 250 for this blog, and the Hobby Table has had more than 300K pageviews since starting up a little over three years ago. Thanks to all of you for peeking in once in a while. I appreciate the comments that come in, and look forward to posting another year's worth of hobby and game articles in 2014. Now, let's see what we can knock off before the end of the year.